Painted kitchen cabinets came back with a bang! It was not too long ago when pretty much everyone turned away from those vintage and retro hues and adopted a more modern approach toward kitchen cabinets. Beige, cream and brown became the order of the day. But then, fashion and interior design always have a wonderful way of surprising us by turning back the clock and making the vintage cool again! Colorful kitchen cabinets are quickly topping the list of the hottest design trends of 2014 and are set to stay on trend for 2015. Purple: It is the color of the year, after all. Purples and violets have been all the rage in the last few years, and every major fashion company and interior design giant predicts that these colors will continue to stay relevant in the next few years to come. Purple looks especially stunning in any setting that it is placed and instantly gives the room visual richness that is simply unmistakable. While purple has a lot going for it, painting your kitchen cabinets purple means that you should pay particular attention to the surrounding decor and matching hues. If you love an eclectic look, this is barely a problem. Grey: We've said that grey is the new black. But now we hear that it's "the hottest neutral on the planet today." If you are starting to feel like grey is becoming more prominent all around you, then your observation is spot on. While many homeowners feel that grey for kitchen cabinets can be dull, that is hardly the truth. Warm, deep greys add sophistication and style with ease. But to truly experience the magic of grey cabinets in the kitchen, opt for textured finishes and hip patterns that elevate the cabinets in a sleek and minimal home. White: There are a lot of folks who quickly raise an eyebrow when we tell them that white can be as engaging a color for kitchen cabinets as any. But the inspirations featured here will quickly change your mind. A simple yet cleverly done kitchen in white can make a perfect backdrop for any accent color you wish to include. Painting kitchen shelves white helps accentuate this appeal. You can obviously pair white kitchen cabinets with any other backsplash of your choice. If you have a problem committing to an accent color, this is the best way to ease your nerves. 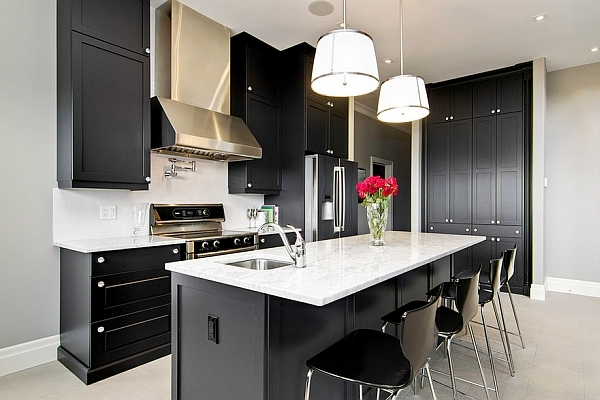 Black: Black is not one of the first colors that come to mind when thinking about new kitchen cabinets. Yet it is probably the most natural fit in any contemporary kitchen with clean and well-defined lines and glossy, lacquered surfaces. Bringing together both black and white kitchen shelves is a classic design choice that will never let you down. A more daring approach to using black would be to couple it with dashing red that is equally audacious and prominent. 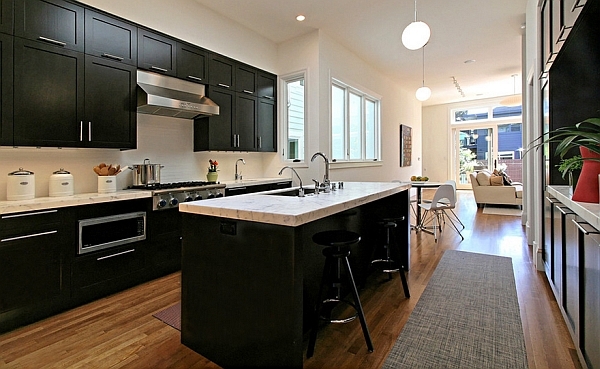 Posh and urbane, black is for those who love a hint of minimalism in their kitchen.